This is a winner for us because my daughter who won't eat sausages on their own enjoys them in this sauce. 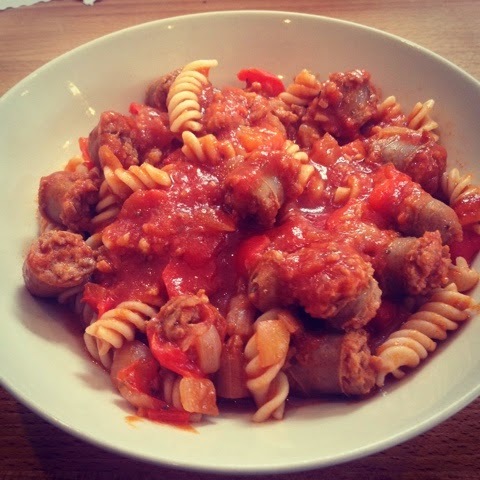 My son, who would eat sausages for every meal is happy to gobble up the sauce, red pepper and all! I make up my own Italian mixed herbs by mixing together equal amounts of dried oregano, thyme, basil, sage and rosemary. I always make at least two family sized portions at once - simply double up the ingredients below. We serve this with brown rice or buckwheat pasta and some buttered green beans on the side. It would also work well on its own with a green salad. - Heat a tbsp of oil/fat in a large pan and add the sausages, cooking for a couple of minutes before turning over so they are browned all over. (If you are cooking more than one portion it is best to cook the sausages in batches) Remove the sausages from the pan and set aside. - Once it reaches a vigorous simmer reduce the heat so it is simmering gently and cover. - Simmer for around 40 minutes or until it reaches the desired consistency, stirring occasionally to prevent sticking.